In lieu of holiday gifts for clients this year, Vanguard decided to show its appreciation by honoring its mission and its clients' commitment to social change. Washington, D.C.-based Vanguard Communications, a Hispanic-woman owned PR firm focused on communicating for social change, is giving back this holiday season. In lieu of holiday gifts for clients this year, the firm decided to show its appreciation by honoring its mission and its clients' commitment to social change. Vanguard donated a total of $1,500 to food shelters across the country on behalf of its clients. Donations were made to food shelters in the cities where clients are headquartered. 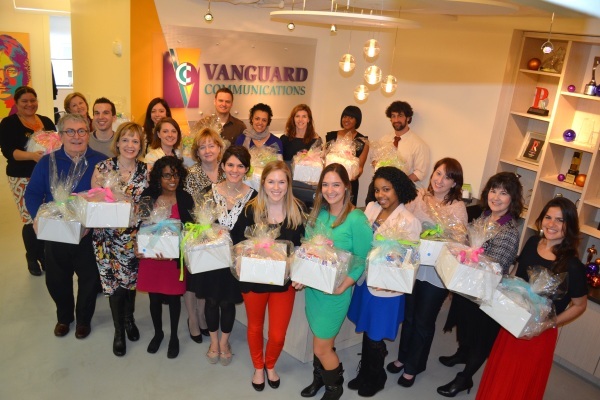 In addition, Vanguard's staff of more than 30 prepared care packages for pregnant women and mothers in need. Staff donated all of the items included in the care packages as well as their lunch hour to assemble each gift. Care packages included supplies to help mothers of young babies from birth to 12 months such as clothes, bottles, books, and toys. Care packages were delivered to the Healthy Babies Project, which connects high-risk, underserved pregnant D.C. women and families to health care, social services, and educational opportunities.